Message from MASUDAEN | MASUDAEN Genuine Japanese green tea shipped worldwide directly from our tea farm in Makinohara, Shizuoka, Japan. We have 20 hectares of land which is contracted farmers, and 8 hectares of our own tea fields. Whatever we harvested that day comes to our tea factories and is processed on the same day. In the normal year, our harvested tea amount is 350,000 kg, which can create approximately 87,000 kg of half−processed tea (Aracha). We do the whole process according to our safety management manual, and we keep all the records of our production. 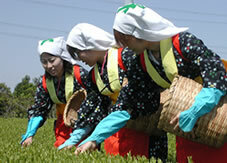 We plan our farming and harvesting so that we can process green tea leaves while they are fresh. In terms of the tea processing engineering, we do thorough control of tea making, so that all the harvested tea leaves will be processed efficiently. 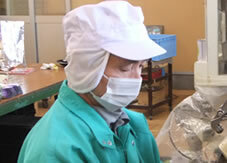 Also, we make all the record of sanitary management in the finishing process. We are especially careful to prevent the entering of unnecessary objects in our factories from the outside, so we do no use wooden pallets, and we use double doors so that bugs and trash will not come from outside the factory. We have 2 finishing lines: 2,000K line and 500K line. 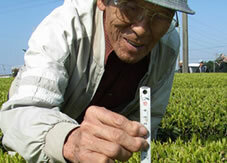 We use 500K line for finishing high−end teas. Our giant refrigerator is operated fully automatically, and all our stock is managed by computer. Thus we have all the records of our remaining teas and the conditions of teas. We keep records of our production using a "raw tea manufacturing management log" and "safety management record log". For our raw tea, we provide our customers with a "raw tea material safety warranty" and a "raw tea manufacturing records log". Also for our finished teas, we provide a "finished teas safety guarantee" and "finishing tea process management record log". Thus our traceability is secure, and the safety of our customers is sure. We know exactly where a certain tea is harvested and in what condition. Our 2 automatic packaging machines can package 4,000 bags per day. Our 2 hand receiving automatic scales machine can package 4,000 bags per day. Tea bag machine can process 15,000 tea bags a day. Our shrink wrapping machine can process 2,000 boxes a day. We do all packaging processing after checking everything with our eyes to prevent unnecessary objects. For delivery of our products for domestic customers, we use regular shipping methods or by our own trucks. For exporting, we put our teas into large trucks and they will be delivered via air or by containers at the docks of ports. The difference between normal tea merchants and Masudaen is that most of the tea wholesalers and retailers do not have their own tea fields and processing factories. Masudaen takes care of the whole process from farming to packaging and wholesale and retail sales. So we can actually see with our own eyes how our teas are being grown and processed. Thus safety and security are guaranteed in this way. We volunteer to provide field experience tours for local elementary school students, so that they get to know the importance of agriculture in the community. We do these kinds of activities to generate fans of green tea by cooperating with local schools. Masudaen’s cultivation instructors and local tea growers go around tea fields regularly to grasp the condition of the fields, and predict the time of harvesting and amount of harvest. 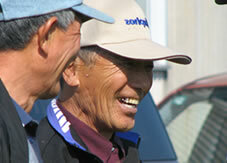 This is also good for local tea farmers to see other tea fine fields and it is very educational for them. Also, we invite tea growing scientists from outside and have some study sessions. We visit other tea factories that are of good reputation, so that we can learn the latest techniques and hone our skills.